On this day, October 27, 2013, it was a Sunday. As we do once a month, my extended family gathered together at my parent’s house for noon lunch. While we were standing next to the front door, saying our good-byes for the day, my 3-year-old niece Autumn jumped up on me, put her little legs around my waist, and her arms around my neck. She looked at me with those beautiful eyes and smiled, telling me how later on in the week she was going to dress up in “all white” for October 31st. We hugged, I told her I loved her, and out the door she went. I didn’t know it at that moment, but that would be the last time I got to hold her, hear her voice, and see her smile here on earth. Around a month ago, at sunrise, I stood at my kitchen sink window to let the sunshine in. I’m not one that likes the dark; in fact, I can still get scared of it. As I opened my blinds and looked upon the clouds in the western sky, I instantly noticed they were reflecting beautiful shades of pinks and purples. 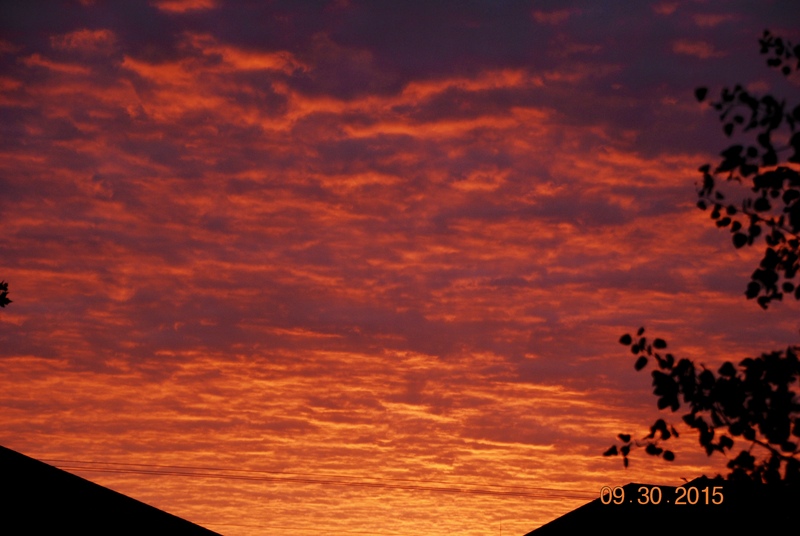 I immediately went to the other side of the house, opened my front door facing east, and what I saw was one of the most glorious Autumn sunrises that I can remember. I found myself just standing there with my thoughts reflecting on my Heavenly Father, quickly realizing that this was a gift from Him, the start of a new day. The rest of the drive to school, we talked about heaven, what the Bible describes it as, and how our minds can’t even imagine how amazing it must be. I feel that God gives us glimpses of extraordinary beauty here on earth only to remind us that the best is yet to come. We talked about Uncle Rodney, Autumn, and all of the other believers who God has called to their eternal home and what they must possibly be experiencing. While it hurts our hearts because we miss those we loved dearly, the comfort knowing they are in a place where only life and love shine forth, gives us peace. Revelation 21 also tells us that the Holy City, laid out like a square, has 3 gates all made of a single pearl on each side. Each wall has twelve foundations named after the twelve apostles. The walls are made of jasper, the city streets of pure gold, as transparent as glass. The foundations are decorated with every kind of precious stone: jasper, sapphire, agate, emerald, onyx, ruby, chrysolite, beryl, topaz, turquoise, jacinth, and amethyst. This past Sunday, two years later, my extended family and I gathered together again, like we continue to do once a month for noon lunch. My father stood up to read out of the Bible, and before he did so, we had a moment to remember Autumn. He asked if any of us had any special memories to share and while many were running through my mind, the lump in my throat was too big to allow me to speak. Sitting here now, this morning, that lump is still there. The beauty of writing however is that it allows us to share our voice from the heart without having to open our mouths to speak. One of my favorites is when she would come to my house to visit and then need to take a nap. I would take her up to my bedroom and tuck her in under the covers. She would lie on her side; knees curled up and smile at me. I would always bend down, give her a kiss, tell her I loved her, and just smile back as I noticed how little she looked in my big grown up bed. I loved how she used grown up words at her young age and the spunkiness and feistiness that she possessed. Despite that however, when it came time for the yearly 4th of July fireworks on our driveway, she would get scared and stand inside the house with her hands over her ears and watch out of the window. She was a little rock star and perfected the rock star hand sign. Shortly before her death, she performed for me the song, “Monster” from Skillet, getting the monster voice just right and I laughed at hearing it. She loved music as I do. She was a joyful little girl who’s favorite color was purple and brought light with her wherever she went. She is my niece and I loved her and love her still. Friends, we live in a world with much pain, sadness, anger, frustration, injustice, fear, and so on. In recent weeks alone, I have heard of several deaths of young people, very sick children teetering between this life and the next, friends my age getting diagnosed with cancer, friends in chronic physical pain, and the list goes on. As my boys and I continued the conversation on our drive to school, we talked about the sadness this life can bring. I reminded them that we were never promised a long life or a life free from pain or suffering. We do however have a Bible that we can go to, a Bible that holds promises of many things. This world might feel like a battleground but that’s because it is. Carry on in comfort knowing that He goes before you, will never leave you, and we need not to fear the dark days. Keep looking up friends. Let the light of the one and only Son shine through you each and every day to reflect the beauty of Him as the western clouds did that recent morning of the eastern sunrise. Today as my heart is reflecting upon the last time I held Autumn in my arms, it feels heavy. However, I hold comfort in knowing where she is, who she is with, and I look forward to walking along the streets of gold with her, Rodney, and all those loved ones who have went before me. So well written, Rachel! So well written! Keeping your family in my prayers. 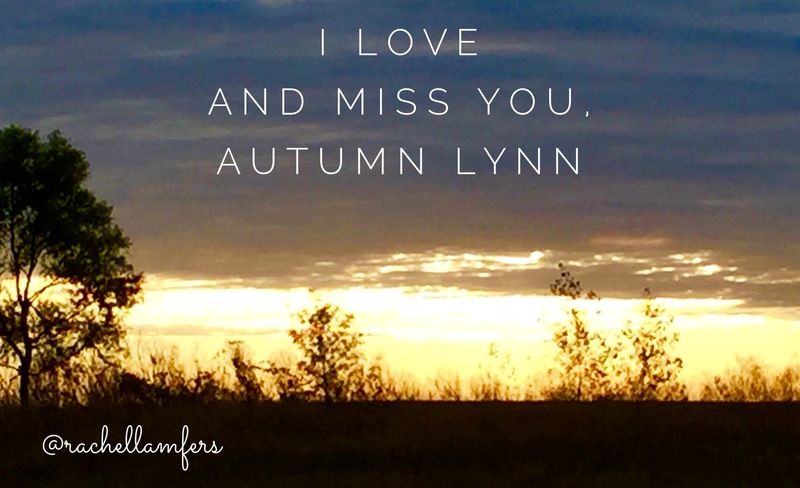 Rachel, thank you for sharing some of your story as Autumn’s aunt, the autumn sunrise, and the beautiful scriptures, sweet reminders to us as we look up and forward to where our treasure is. Just so inspiring Rachel – good to read another post. Sad but comforting at the same time. What a day that will be, when my Jesus I shall see. When I look upon his face… And then there are the other that I will see when I can pull my eyes off of Him!